There’s something in this book for all photographers, no matter what level they are. You can take great photographs no matter what sort of camera you have, whether is a pocketable compact or something that looks like an artillery piece. It’s not the camera that’s important. It’s the eye behind the lens. This book, The Greatest Photography Tips in the World will give you some of that knowledge in straightforward, non-technical language. It is a fully-illustrated, 200-page hardback book, and the perfect guide to using your camera more effectively. Though written with a humorous tone, Alistair’s book gives serious guidance on everything from buying your equipment, through using the camera’s exposure controls, to techniques for portrait, landscape and family photography. There is even a chapter on earning cash from your camera. Buy this guide and keep it handy in your camera bag. You will find it hugely useful. 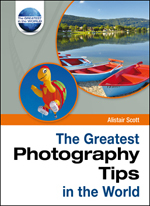 You’ll find Alistair’s Greatest Photography Tips a source of information and inspiration – a valuable addition to any photograher’s bag of tricks. A book to dip into again and again. Click here to browse in its pages. Books can be signed on request. Please give the text you want in the box below. This is the best photography book i have bought. Particularly if you are starting off. Simple. To the point. It even has financial advice. This great little book is packed with photographic information. Every tip is spot-on. Having not long bought my husband a new Canon camera with all the trimmings, we took this book with us when we set off for Australia at Christmas. Not only was it a good size to take in our carry-on, it was written in terms that we could understand easily, but which encouraged us to try so much more than we would have done on our own. Well worth the money, whatever your knowledge and understanding of photography. I love this book! I thought it would make sense to get a good book on photography because I’m about to have my first child. That was a GOOD CALL. There’s a whole chapter on photographing children, which I read first, but then I read the rest of the book because it’s funny! There was lots of interesting stuff I didn’t know, especially in the chapters on lighting and composition… but it’s funny! Alistair Scott is obviously an expert in photography, sure, but he’s also hilarious. I’m using my camera far more, and I even bought a copy of this book for my brother (It’s hardback, but compact, with high-quality glossy paper and a ribbon bookmark – surprisingly nice). If you want a comprehensive book that is still lots of fun to read, this is the one.